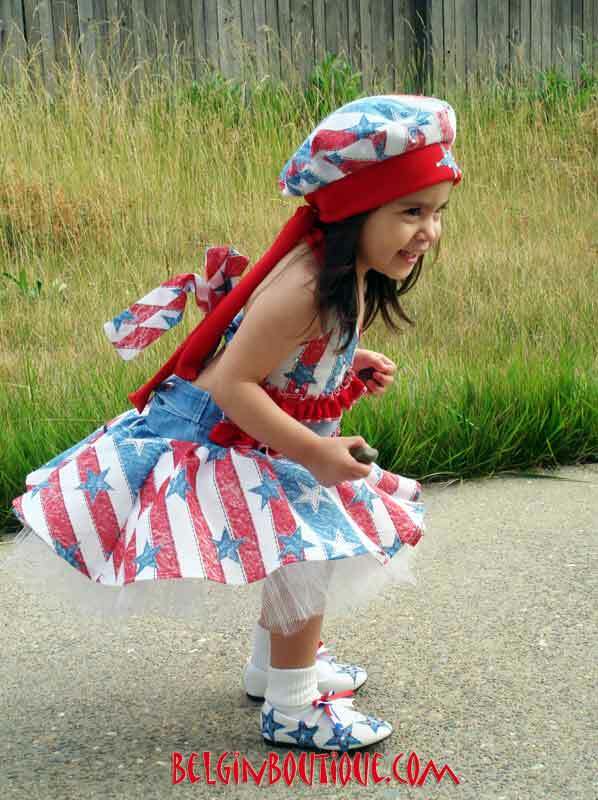 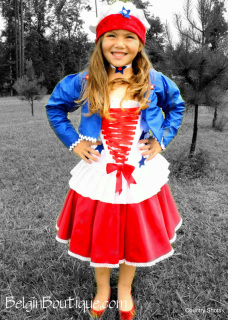 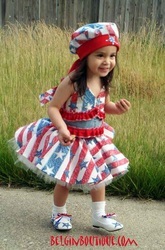 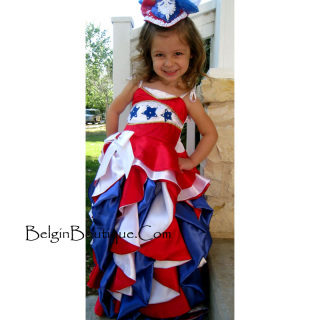 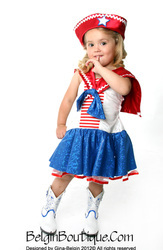 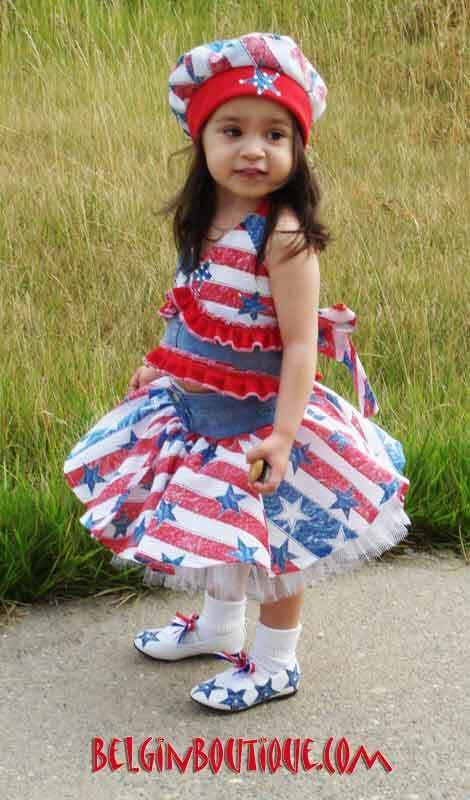 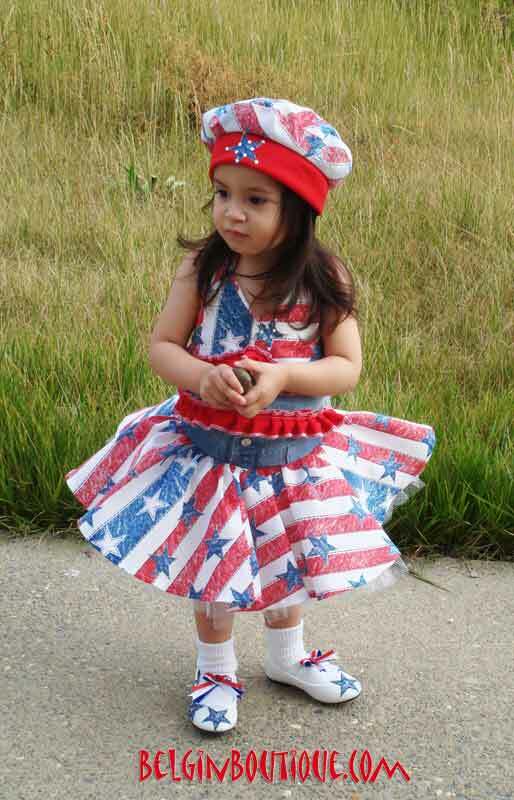 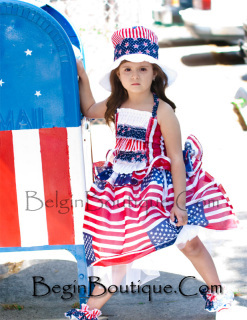 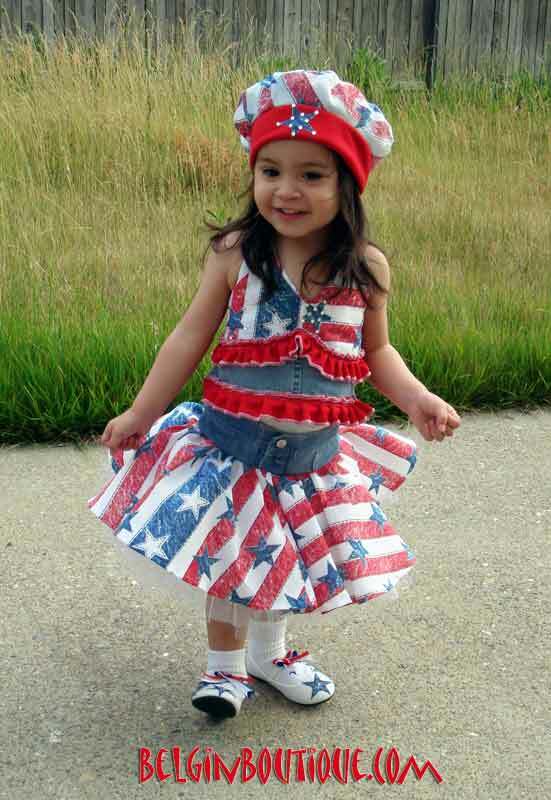 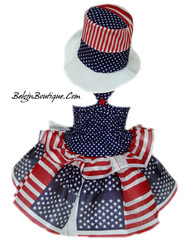 The top is made from white satin, adorned on front with a USA flag handmade with red sequins and blue stars. 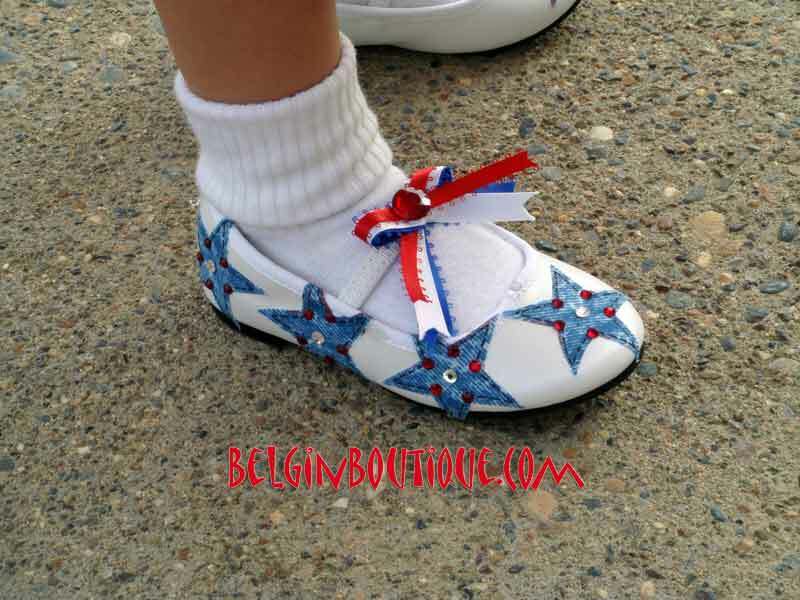 Each star is adorned with crystals! 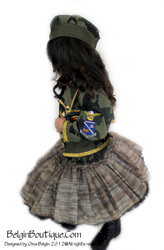 The back is made with elastic for the perfect fit. 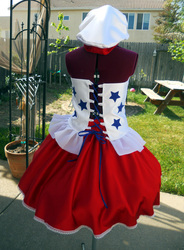 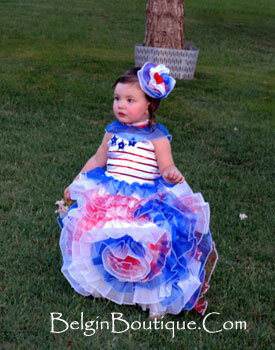 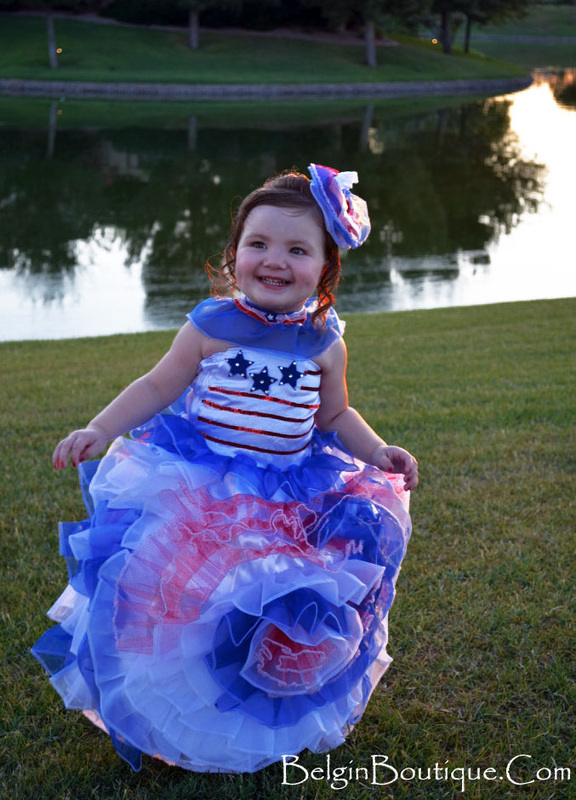 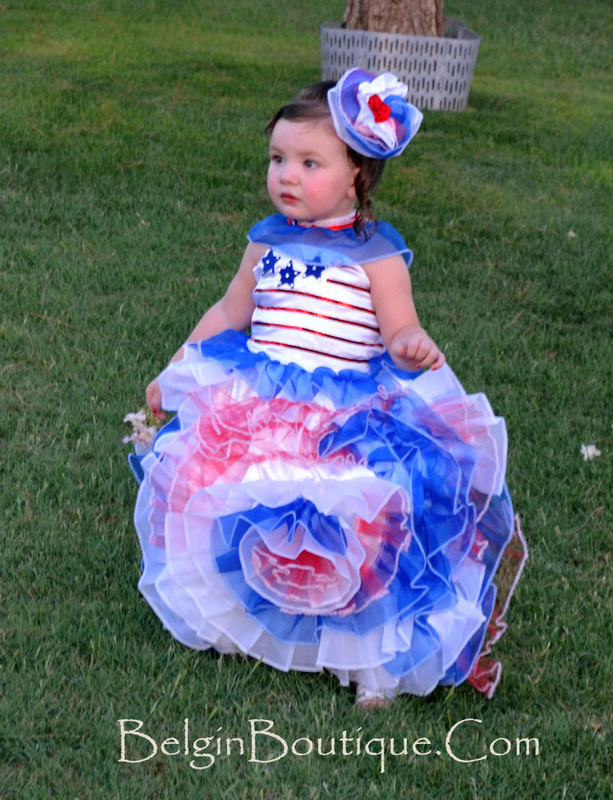 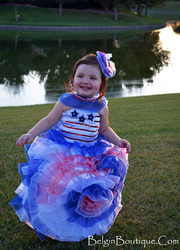 With ruffles, I created a gorgeous rose from red, white, and blue fabrics. The back has a ruffle cascade from matching fabrics. The dress comes with a matching choker and little hair rose. 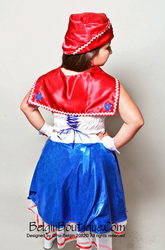 The corset top is adorned with red trim and several blue patchwork stars. Each star is cut by hand. The corset closes on back with lace-up style. 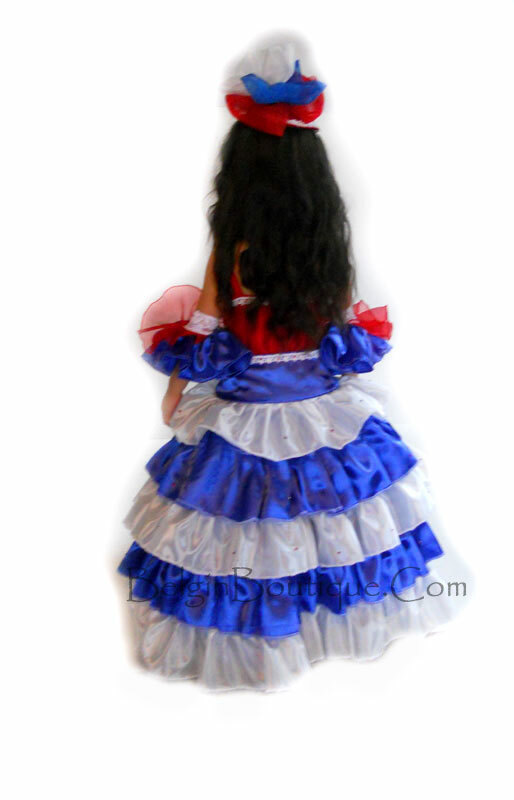 The skirt flows to mid-calf and is made from red satin. The corset is made from stretchy satin. 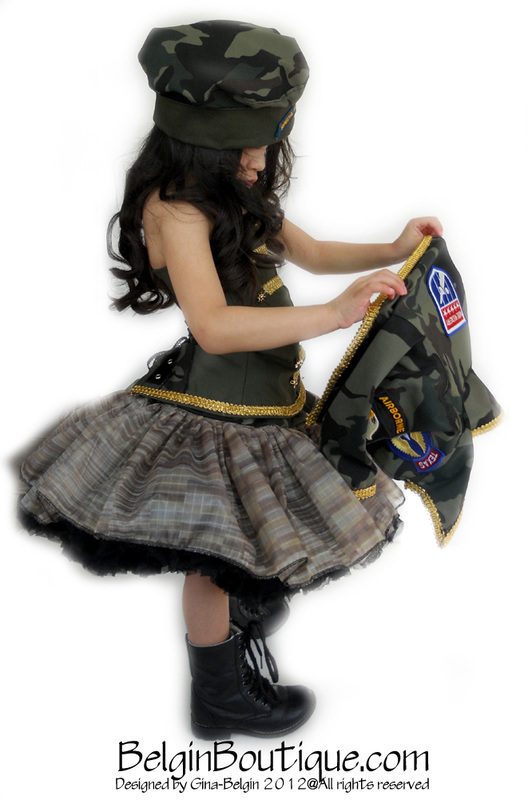 Fully lined with a lace-up close on back. The front is adorned with a gold accent glitz with amber stones similar to the original set. 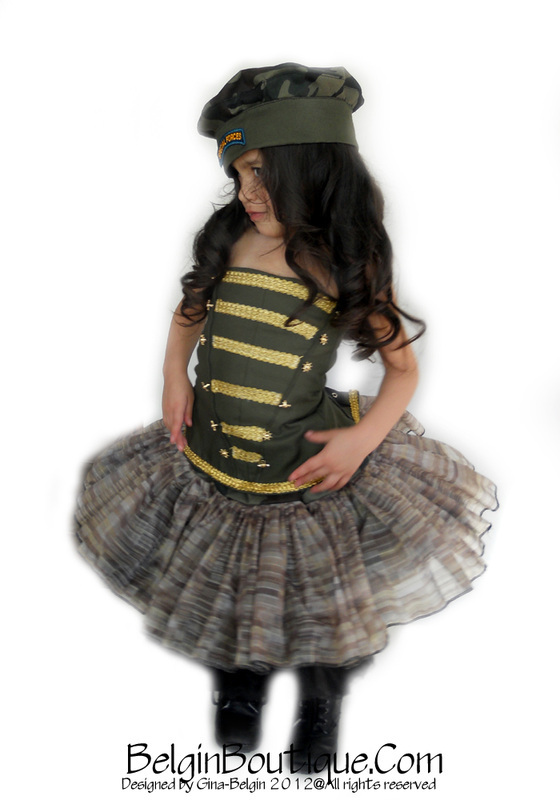 The corset comes with gold lace. The shorts are made from super stretch satin and are fully lined. 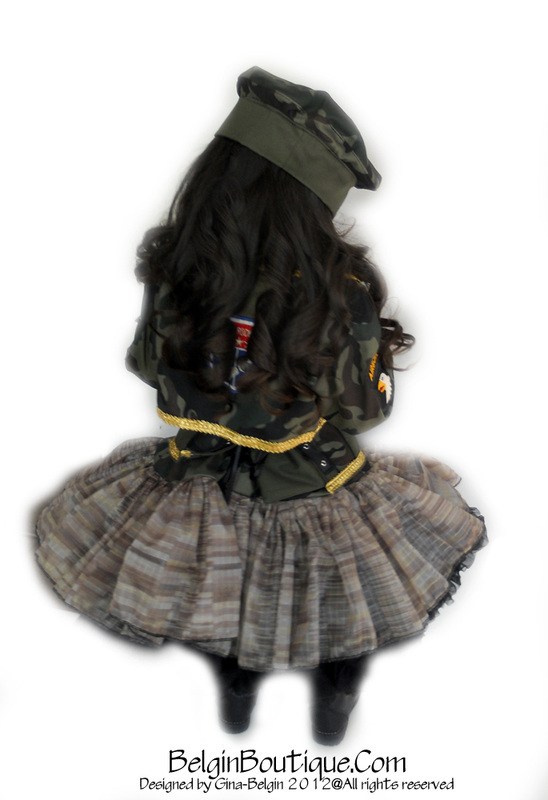 Elastic on back. 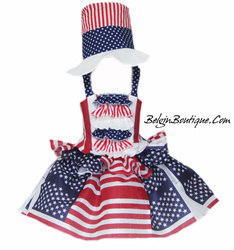 The two pieces will give mobility to your little girl. 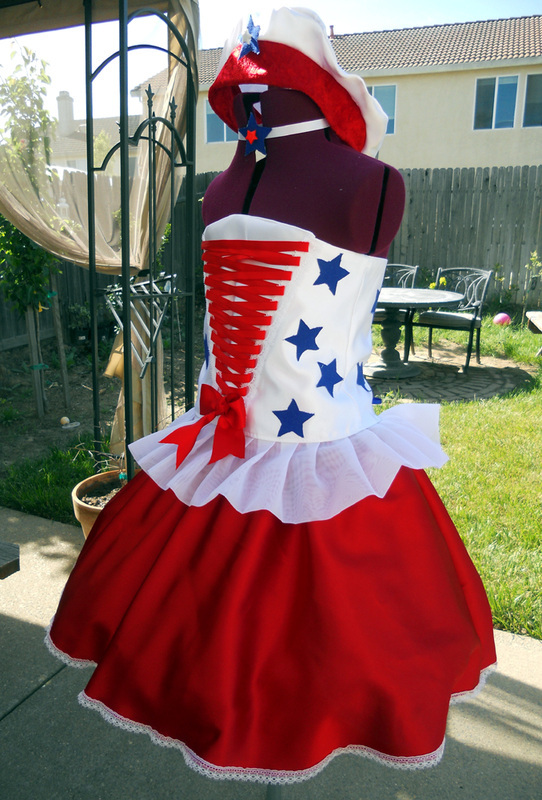 I added some white stars on front of the shorts. 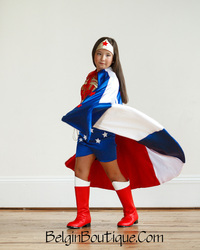 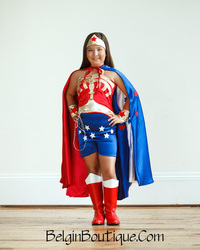 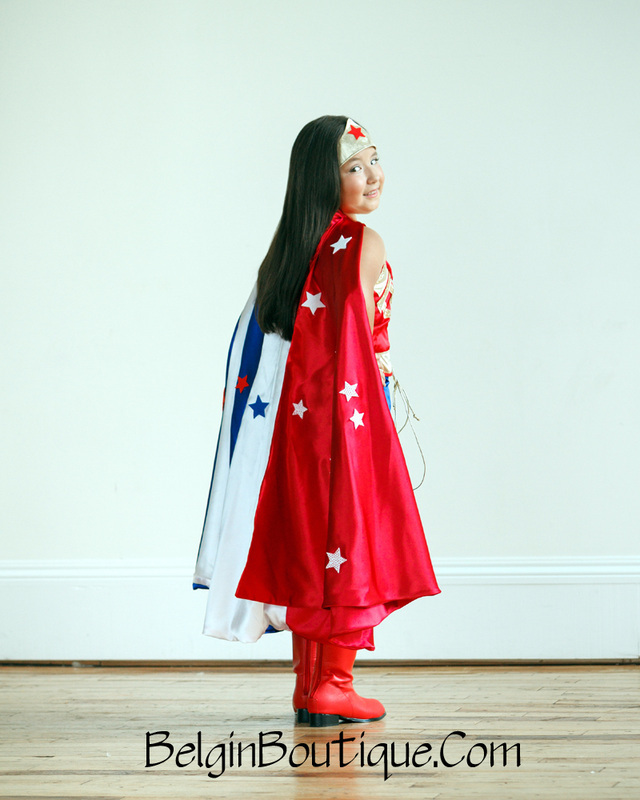 The included and reversible cape is made from three colors. 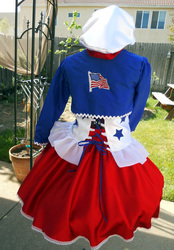 The cape is adorned with stars in red, white, and blue. 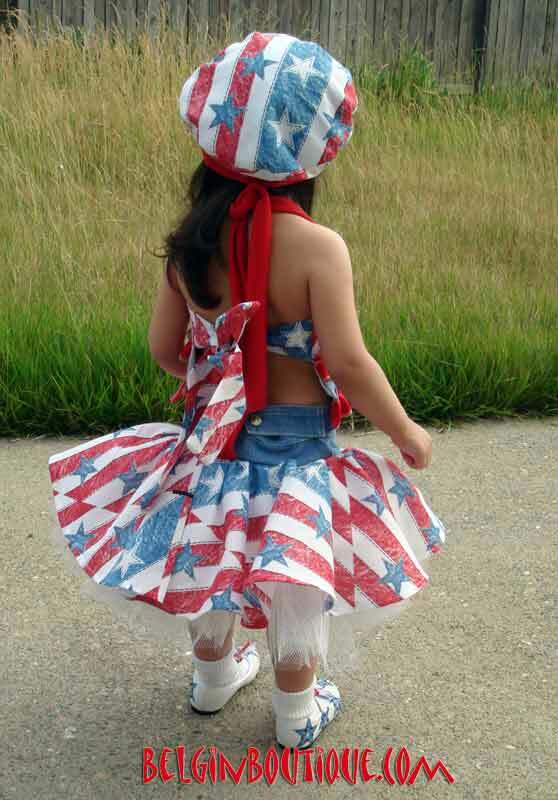 Each star is glued perfectly to avoid falling off. The dress is heavy stoned and made in red with a tricolor ruffle at the hem. Full length. 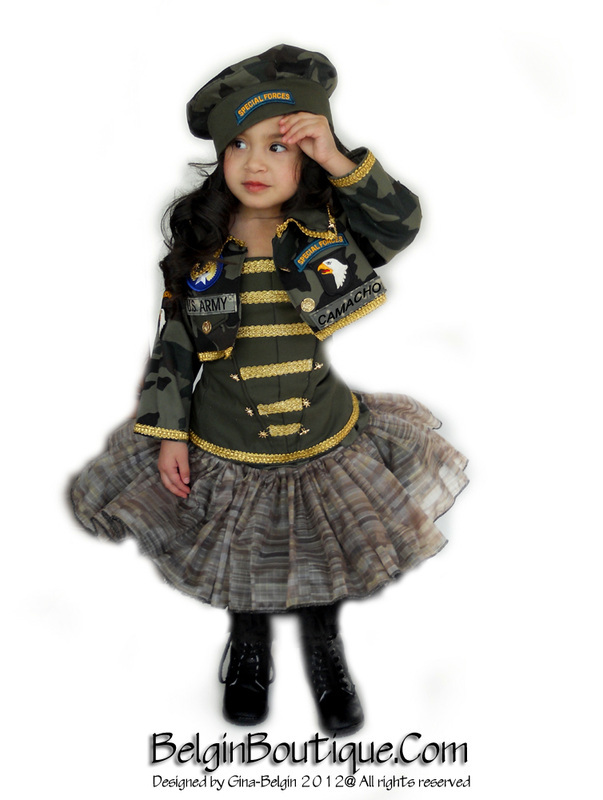 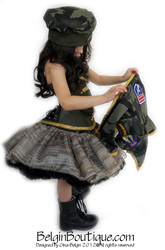 Detachable ruffle skirt that closes on front in lace-up style. 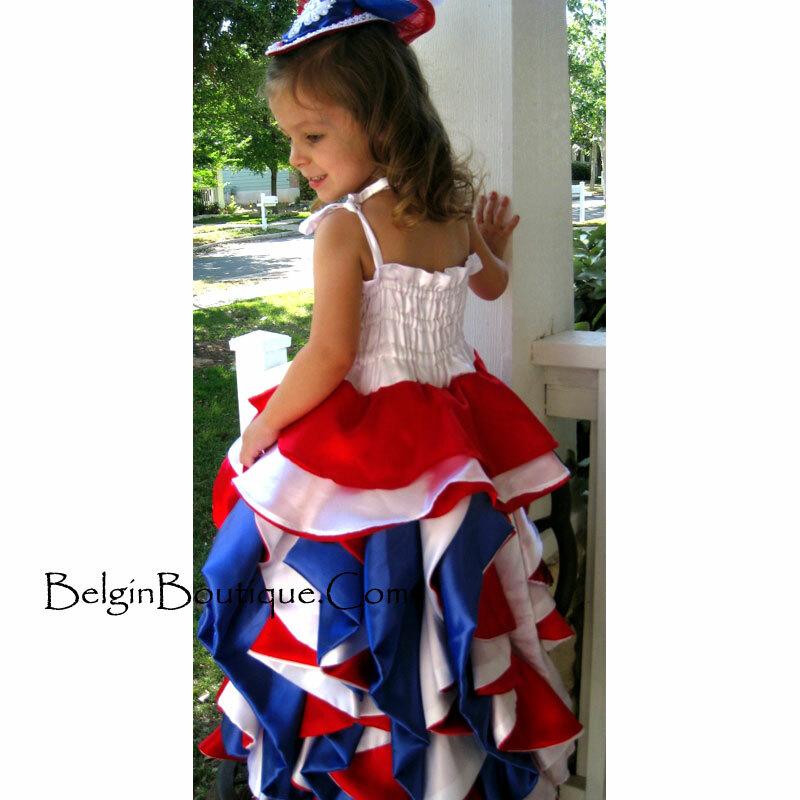 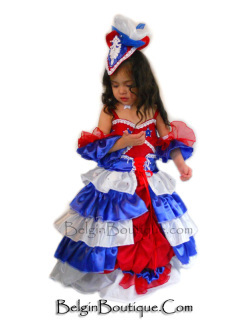 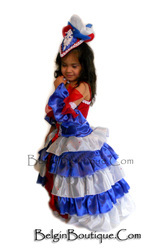 The ruffles are made in red, white, and blue. 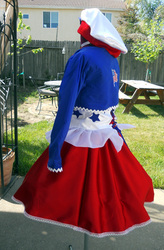 The arm sleeves are made from matching fabrics. 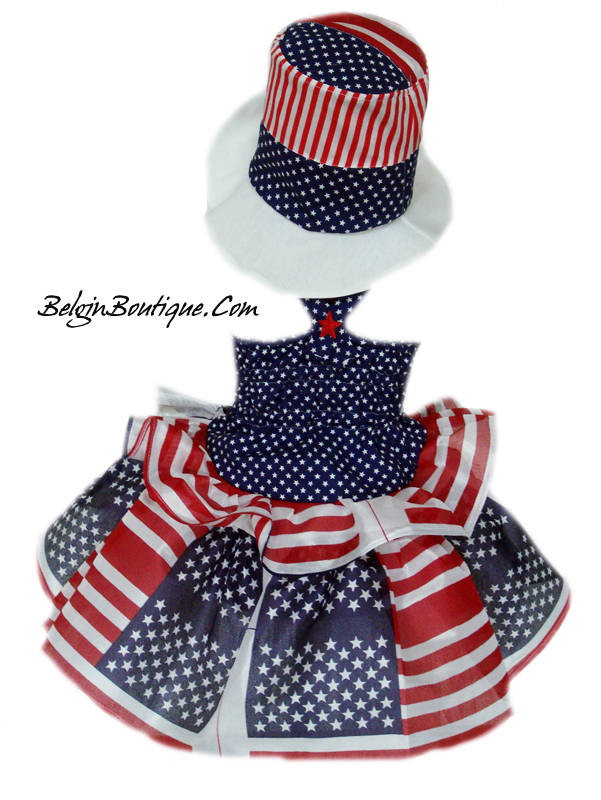 Hat is included. 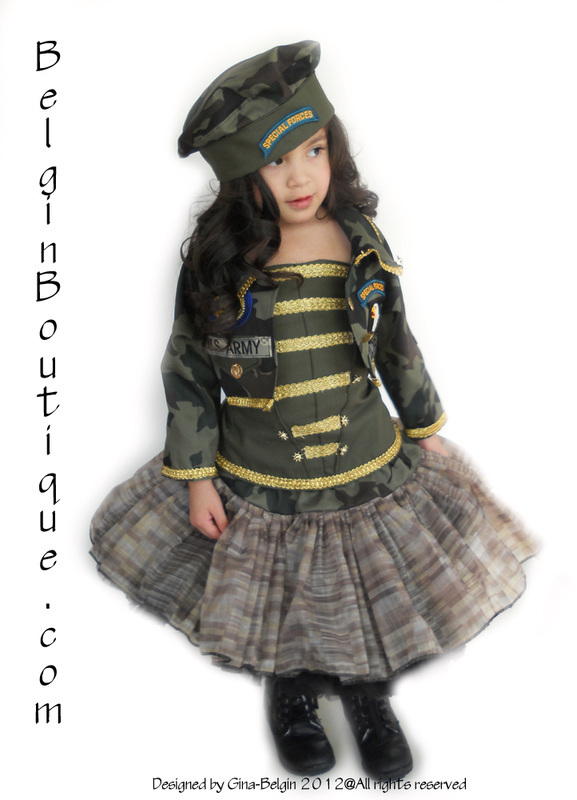 Heavily stoned and adorned with hand-sewn details. So unique! The halter top ties on the back of the neck. 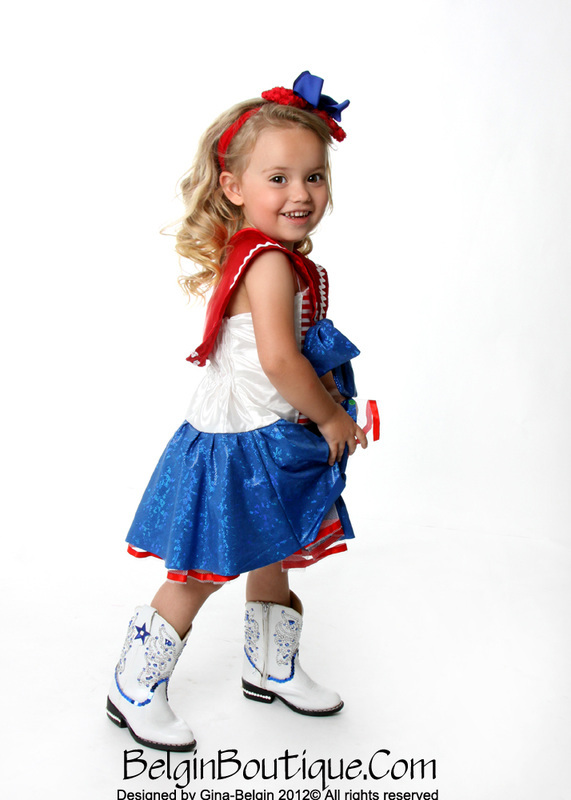 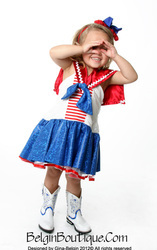 The front is made from a USA flag fabric and denim, adorned with crystals on each star! The skirt is made in a circular style from a matching fabric. 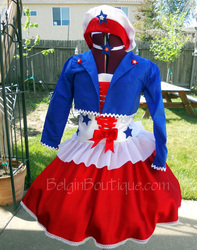 I also used a denim jacket to create a cute skirt style! 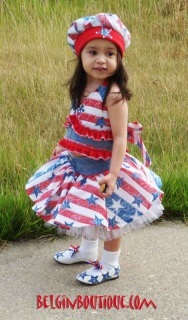 The denim could vary in color shade the usa flag fabric could be vary just depend in what is available in the marke. 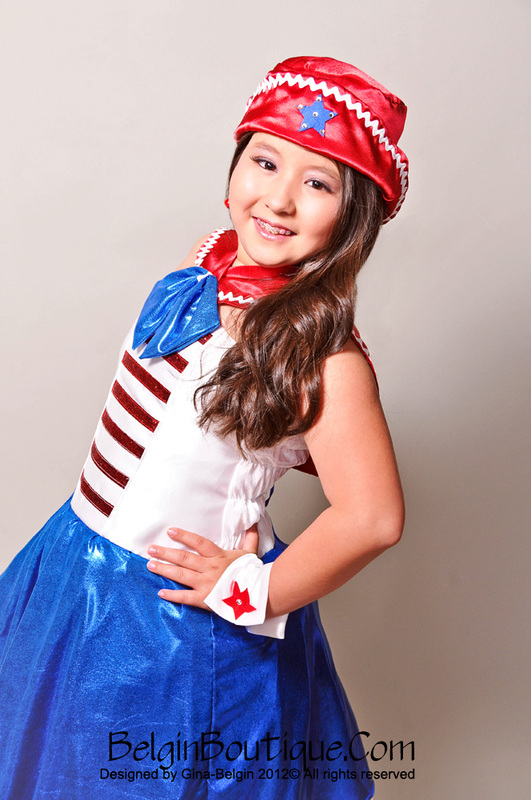 The barrette hat is adorned with crystals! 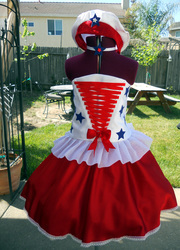 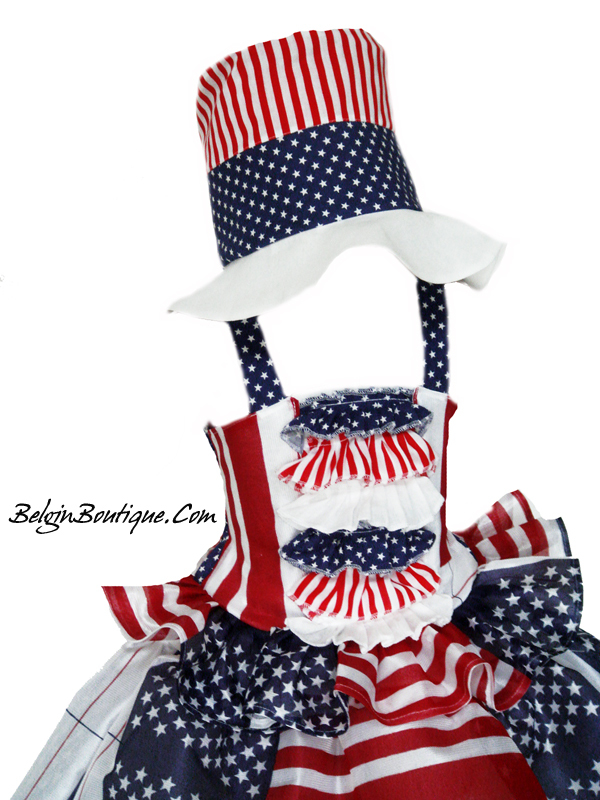 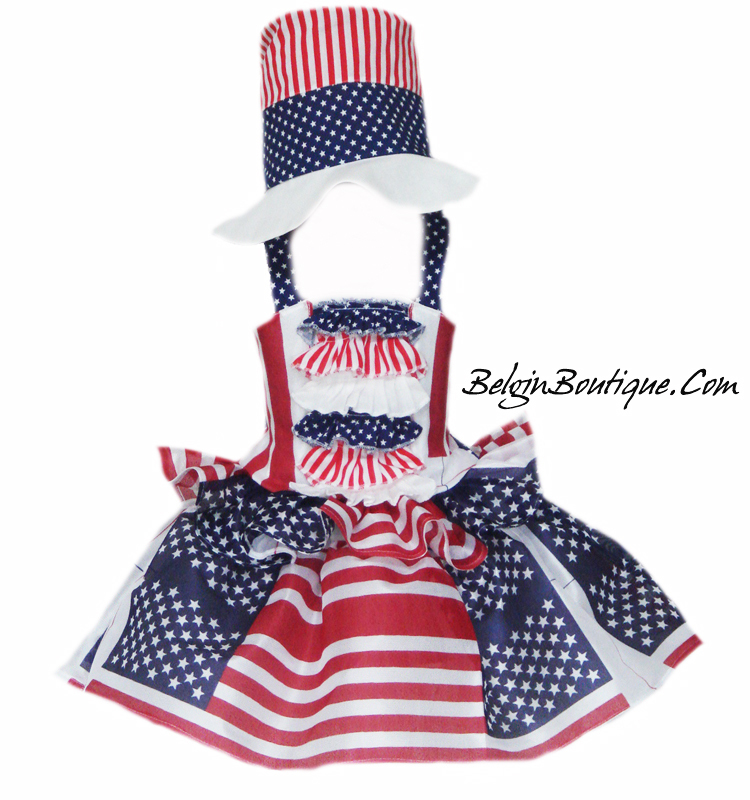 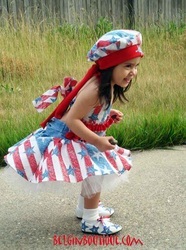 The corset top is made from USA flag colors with three different fabrics. 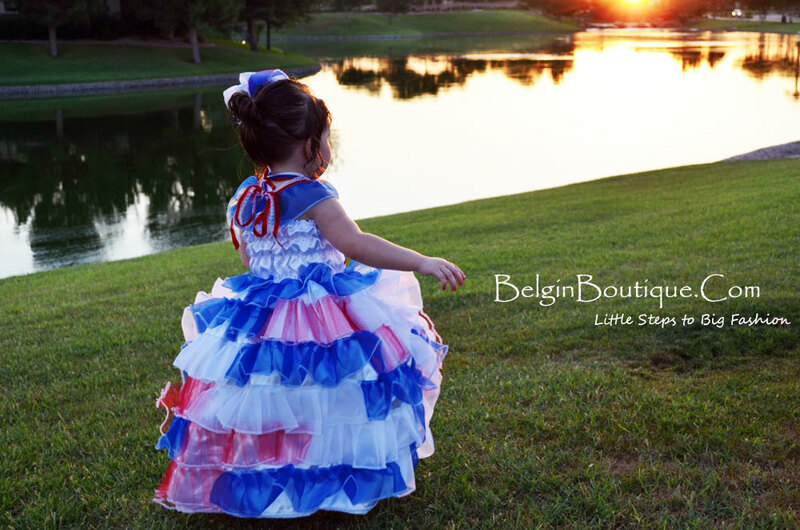 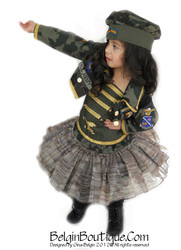 The skirt is ballerina style with tulle crinoline underneath. 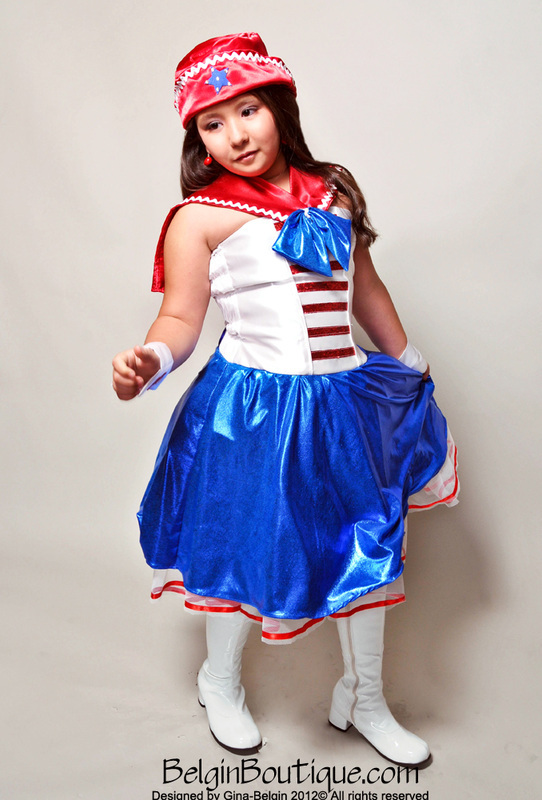 Nautical cropped top is made from white cotton straps and blue metallic fabric with elastic on back. I made a cute red bow on front. The nautical collar is made from white cotton. 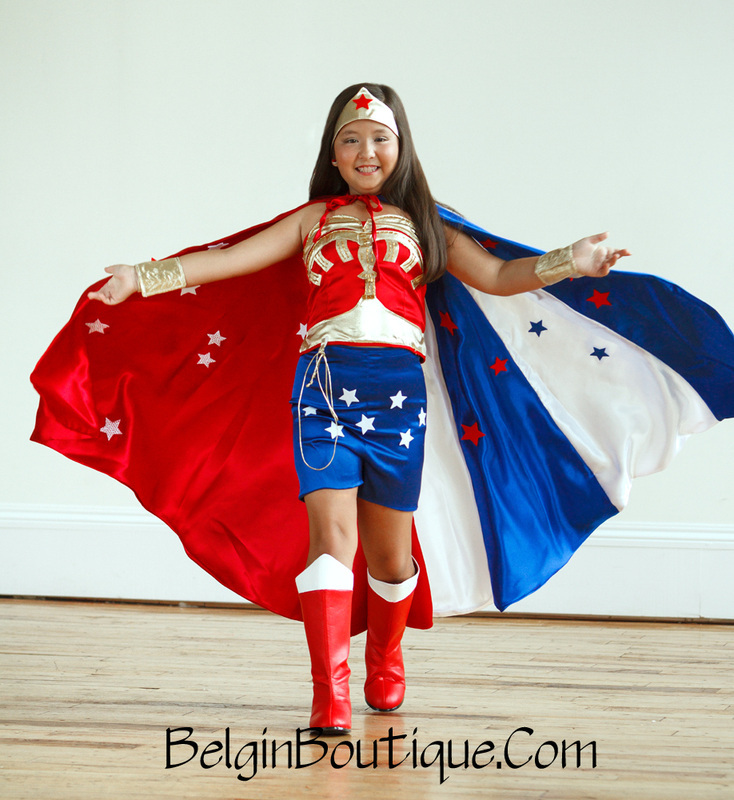 The pants are made from a metallic ocean blue stretchy fabric, adorned with a white square on front and gold buttons!